New high performance processor up to 18 core. good for storage and high performance required applications. Intel Xeon E5 2600/1600 v3/v4 processors. socket R3 LGA2011-3 processor, accept TDP up to 145W. Supports DDR4 up to 512GB of registered ECC 2133/2400MHz memory. 1.2V . 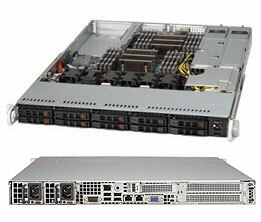 2 PCI-e 3.0 x16 slots full height full length (ready). add riser card option to have 1 more PCIe x8 LP slot. 10 of 2.5" hot-swap HDD bays. Width: 17.2 in. Height: 1.7 in. Depth: 23.5 inch. *** CPU, Memory and hard disk drives are not included. ** can add high speed networking cards. * can add hardware RAID storage cards.